Here’s a paradoxical thing about reviews: you write about a place because you like it (well, sometimes you write about a place because you really don’t like it – but that’s just hateful). But because you write about it, more people know about it. Then your place gets crowded and you may not like it so much there any more. The Guardian’s Jay Rayner once wrote in his review that another client at this tiny restaurant in East London he was covering actually approached him and begged (well, maybe not beg) him not to write about it. Which he consequently did. And I’d only imagine the place is now crawling with food enthusiasts. But that’s to be expected really. It is a tiny restaurant in East London after all. 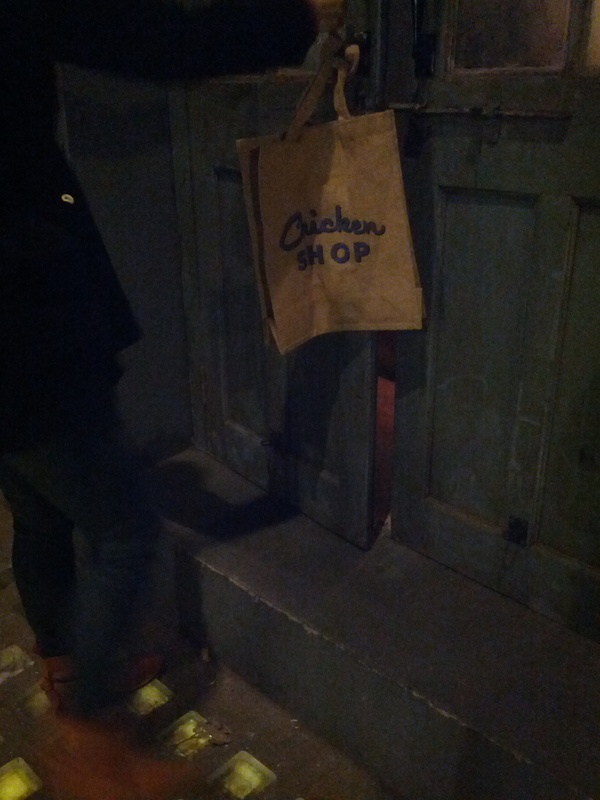 Back to my paradox, I was quite conflicted about reviewing Chicken Shop. I love it. I’ve been 3-4 times, and I intend on returning multiple times in the near future. So it’s in my interest not to alert my London readers who might not yet have heard of this most wonderful eatery of its existence. But it’s too good. And life’s for sharing. Also, you probably will have heard about it anyways. Since it’s one of those faraway, chick, hidden places where a table can only be procured in person with all members of your party present. I went on the website just now to get the link. My oh my. They opened a second branch in Tooting. All for the better. Fewer people to fight with in Kentish Town for my chicken. So here‘s the site. All you have to do is scroll (well you have to click first, but I wouldn’t insult your intelligence by pointing that out. Wait. I just did. Oops). I love it. It’s my favourite restaurant in London by miles. Why? the chicken: I like chicken. I like chicken so much that I love Nando’s (I actually find it super tasty). BUT. But. Nando’s chicken is nothing compared to Chicken Shop chicken. So succulent. So tasty. So yum. the price: is very good compared to other London eateries of a similar nature. Especially if you go in a big group. Though you might not want to go in a big group due to the unbookable nature of the place. If you’re in a group, go early. One person is fine (there’s usually a seat at the counter). Two still good. Three people is getting tricky unless they’ve changed the layout of the restaurant since the last time I went. the buzz: I love the feel of the restaurant. It’s always busy but not too crowded. Unless they’ve tried to fit in more tables, which would greatly disappoint me. But I don’t think they would (not that my opinion matters in this). Service is efficient and friendly. You get what you go for. It’s great for a night out with friends (you can all go have a pre-chicken beer at a pub across the street. They’ll call you when a table frees up.) It’s even kinda romantic if you’re a table of two – dimly lit, digging into those chickens, sharing a slice of pie. I’m going to stop now. Any downside? Not really. I like the fact that you can’t book. Makes it that bit more exciting. And that’s it! My review of Chicken Shop. p.s. I wanna try something. I’m currently in London and will most likely go to Chicken Shop one (well, many) of these days. In the extremely unlikely event that a) you’ve read this post, b) you don’t hate me, c) you happen to be going to Chicken Shop on the same day and at the same time as me, and d) you have an eagle’s eyesight which enables you to spot me in the dim light with my head buried in my chicken and/or pie, would you come say hi? I’ll be absolutely delighted. Also, it’ll freak my man out. I’d like to see that. Thank you in advance. Now I’m dying to try this place. Check this place out before you leave. Apparently the Queen loves it! Oh that looks ex.pen.sive! Slightly beyond my price range I’m afraid. Thanks for the recommendation though.